An American understory tree, the eastern redbud grows to only 30 feet high in an open setting. Multiple forks create a natural vase shape with outward-reaching draping limbs. Shaping raises the canopy above mowing machines and reduces the chances of broken branches and trunks. Bumping with machinery or close cutting with line trimmers exposes the redbud to infection since the thin bark wounds easily. Heartwood decay starts with disease cankers or bark damage and quickly weakens this already brittle tree. Begin pruning the tree in late winter after the redbud's first year of growth. Prevent young trees from developing multiple trunks by selecting one strong central leader and cutting competing suckers back to the ground. Select strong saddle-shaped forks to keep as part of the tree's main structure. Prune out upward-reaching branches with V-shaped saddles and bark clefts. Weak forks fail as the tree matures. Prune the redbud's lower limbs back to the trunk when most of the tree's canopy grows above head height. Lift drooping limbs by cutting low branches back to a main fork. Removing more than 1/3 of the limb could cause a low branch to die back. Cut out weak upper growth as the tree matures. Thinning the canopy by pruning out crossed and crowded branches as well as slender vertical suckers increases the size and strength of the remaining limbs. Inspect limbs for bark cankers--swollen and discolored areas on branches--and remove any diseased limbs. Prune in winter during the redbud's dormancy to lessen injury to the tree and lower the risk of infection. Mulch a 2-foot-diameter space around the base of the redbud with pine straw or sawdust 4 to 6 inches deep. This barrier mulch keeps the base of the tree free of weeds and away from mowing machines. Trim the parasol-shaped branch structure of the popular Lavender Twist redbud by clipping branch ends evenly, 1 to 2 feet from the ground. When branch tips touch the ground, the ends quickly take root. Redbuds bloom most intensely from second-year wood, but clusters of blooms may form anywhere on the tree--including the bark of main branches and trunk. Redbuds usually live only 15 to 20 years and often succumb to disease. Careful pruning reduces the chance of infection. 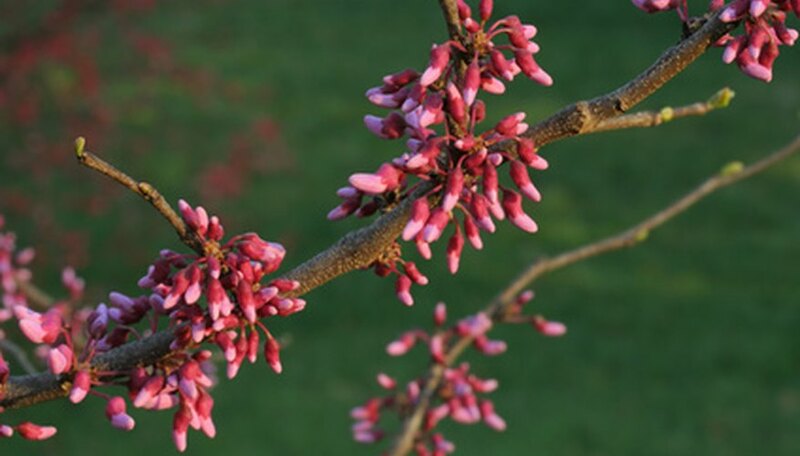 Since the redbud is a legume, the tree grows well without fertilizer and flourishes even in poor ground, but does not tolerate constantly wet soil. Plant the tree in a well-drained location.